The newest three collections from Artistic Outpost have a very natural vintage style, an ode to simpler times. These were inspired by some of our favorite quotes of Henry David Thoreau. His simple advice to "simplify, simplify" are words we should use in our daily life - the hustle and bustle of work, home, and community - as well as in our art. How often do we just need to stamp! Just the act of simply putting ink to rubber is calming and rewarding. 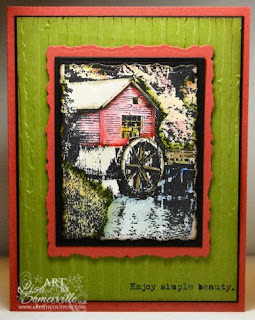 I love all three new plates, the card I'm showing today features an image from Old Grist Mill, colored using the Marker Watercoloring Technique. My tip for stamping these images on Watercolor Paper, is to make sure your Black Archival Ink Pad is well inked, then when stamping onto your Watercolor Paper, be sure you are stamping on a hard surface, and stand up and apply heavy pressure to your stamp. After coloring the image, I cut it with the Spellbinders Deckle Rectangle, then sponged the edges. Layered on a Black Panel, then onto a Rose Red panel that was also cut with the Spellbinders Deckle Rectangle Die. The sentiment is stamped in Black on the Olive panel, then run through the Big Shot using the CuttleBug Distressed Stripes folder. You can SAVE 20% when you purchase all three new stamp collections by September 15th, simply use coupon code: September2009 at check out. Looking to purchase other plates, or just one or two of the new releases, enter code LS-15off and SAVE 15% on your order! I left a message on TJ but its worth repeating! Awesome card! It's a beauty GF, can't wait to see more. Beautiful card, love the vivid colors. How many spellbinder's do you own? wonderful job Lisa! thanks for the tips!